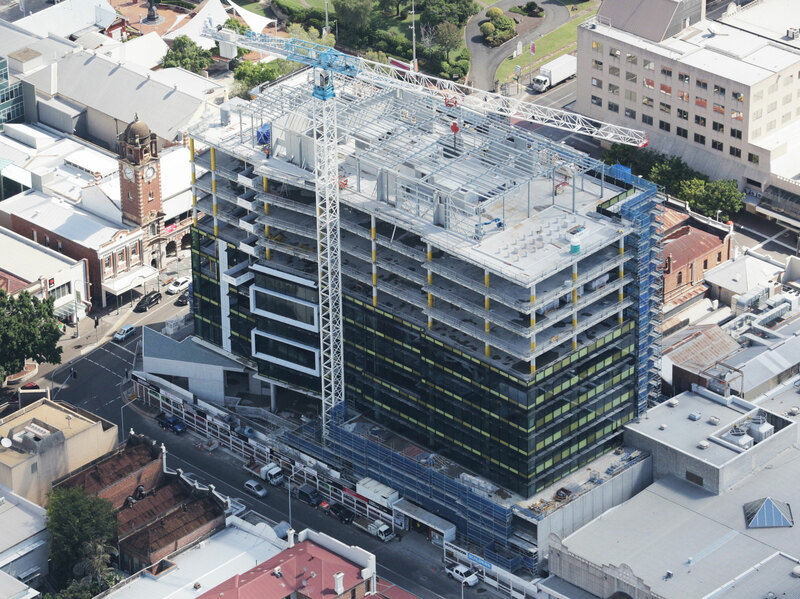 The Ipswich City Heart building is the first stage of developer Leighton Properties‘ $1 billion Icon Ipswich project. Designed by Cox Architecture, it is a 42m high, nine-storey office tower which comprises 15,000 square metres (sqm) of commercial space together with 750sqm of ground floor retail and 200 car parks. The building is an A-Grade commercial development, and is targeting a 5 Star Green Star and a 4.5 Star NABERS rating. Nearly all of the office space in the building has been leased to the Queensland government for a term of 15 years. Construction on the project is being overseen by Hutchinson Builders. G.James has been engaged to supply and install window wall and curtain wall along the height of the building. G.James is also providing structural glazing to the basement, ground and upper ground floors, as well as a structurally glazed roof-lite to level 1. Prior to starting on site, G.James constructed a visual mockup to provide a full-scale representation of the colour selection as designed for the building. The mockup allowed colour selections to be seen in proper context, under natural lighting, to ensure the building gives the desired visual effect. G.James is using the 546 series system with black anodised framing for the window wall on the western façade with independent vertical sunshades installed between structural slabs. These vertical fins are in 5 special anodised colours (listed below) which are selectively positioned on each floor to create a pattern. G.James is using our 546 series system with black anodised framing for the curtain wall to the eastern façade, incorporating gold metallic Alpolic projections and black anodised horizontal sunblades. The southern and northern faces of the building are a mixture of both window wall and curtain wall fully encapsulating the floors. The vision glass used in the building is made up of Solarplus DLE55 Low-E glass on green, configured in argon filled IG Units. The shadow boxes are made up of 6mm green heat-strengthened glass, using 5 different colours (listed below) of backing sheet selectively positioned on each floor to create a pattern. PVF2 paints have an excellent service life and are highly resistant to fading. These properties make PVF2 finishes a low maintenance finish of choice for large projects. G.James started site installation in late January, and will continue until approximately May. Overall, construction on the building is progressing well, the concrete structure of the building has been completed and practical completion is expected to be third quarter of 2013. This entry was posted in Facades, Glass and tagged Coloured Glass, Design Engineering, Kynar, Louvres and Sunblades, PVF2, sun shades, Window Walls. Bookmark the permalink.